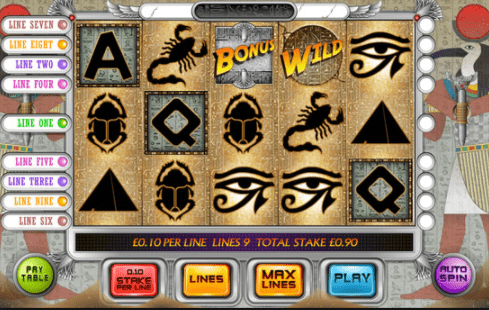 Enter the Mummy’s tomb and uncover the sands of time and your great fortune with these slots online. Navigate yourself through this dry and arid 5 reel. Combine pyramids, scarab beetles, and scorpions to unearth the hidden jackpot treasure as you try these online slots. Eyecon first started in 1997 as a computer games company and two years later they build their first slot game casino system. Since 2003, Eyecon makes a name for themselves with their high-quality online slot games. Filled with creative and innovative ideas, their developer team always comes up with new themes to enhance their long list of launched spin slot games. Eyecon has a big passion for game development and you will be able to feel this in their games, which is one of the reasons why they have become very popular amongst their players. Sands of Fortune is filled with adventure and excitement. Pack a backpack and put on your best pair of boots to go on this discovery journey through the pyramids to discover the hidden treasures and bring them back home with you. You will see the Egyptian drawings in the background, setting you in the right mood for some exciting events. Sands of Fortune is one of the best slots games to play in terms of this theme! On the five reels and three rows you will find some hieroglyphs joined by the Q, K and A, they represent the lower value symbols in this game. You will also see a dangerous scorpion, a beetle, a pyramid and the eye of Ra. Everything is represented by neat silhouettes, giving an extra nice feel to the game. The highest paying symbol is the Jackpot logo and can pay you up to 5000 coins. The wild symbol is a simple Wild logo. It will not give you any extra payout but it substitutes all other symbols except for the bonus symbol. If you land three or more of the bonus symbols, which is represented by a Bonus logo, you will be taken to a thrilling side game. You are presented with three dark passageways in the pyramid and will have to choose where the adventure will lead next. If you find an artefact you will clear the room and win a rewarding cash prize but if you find the skull instead it will trigger a trap door and you will land back to the base game. With the nice Indiana Jones feeling this game will immerse you straight into the adventure. Be ready to discover the 9 different paylines and face a lot of danger. To make part of this adventurous journey you have to place a minimum bet of 9p or up to 13.50 pounds. Sands of Fortune is an exciting video slot that will draw you into the adventures of a treasure hunter always looking for new rewarding artefacts in the darkly hidden chambers of the pyramids. With the thrilling side game, your gameplay experience will turn even more eventful and lucrative. The game feel is enhanced massively by the soundtrack that will emerge you into this dangerous trip. Sands of Fortune is a very engaging slot game that is perfect for a little bit of adrenaline and adventure to distract from the dull work routine. Once you've conquered this game then have a go at gonzo's quest slot.